This is what it looked like a year ago. Still completely white and tiny. Sorry about the bad phone photo. Can't tell you how much I enjoy watching the clowns roll around in it like a dog rolling on something stinky! OK computer issue delt with. This is today, one year later! pretty impressive how it changed in a year, looks pretty cool and the clown seems very happy. Very nice! How do you judge if it needs/does not need cipro treatment? I am no expert but the LFS had it in less than ideal conditions and it was still alive after about a month. I'm pretty sure if it had gotten an infection during shipping it would have already died before then. Was just my thinking anyway and it worked out even if it did take a while to come back to health. Typically we look for deflation of tentacles, and typically it can look fine for hours/day, then look horrid, and this can go back and forth, so a qt and observation is advised, at least a week IMO. OP's mag looks great, hope that continues, keep posting pics! I had a QT tank setup ready to go. I never could find a way to buy cipro. My vet (for horses) and my doc neither would give me the rx for it. The LFS store was even afraid to give me some he had because that is against the law. All is well now but we will be building a new house in a couple years and will have to find a home for this one but will have a 6' tank in the new house and will want another mag. for that tank. So how do you all get your cipro? I had a QT tank setup ready to go. I never could find a way to buy cipro...... So how do you all get your cipro? Google Fish Flox. There are multiple sources. That's beautiful, and one of the smallest mags I've ever seen! I didn't know it was packaged as Fish Flox. I will make a note of it for the future, thanks. The nem had not moved more than an inch or so in the last several months but right after I posted here he started moving around. He doesn't really have far to go till he runs out of rock so not much of a problem. I have not fed the nem in the last 2-3 months and it is a little alarming how fast he is still growing. Thought I'd share a FTS. Going to have to find my lobed brain coral a new home, it has just about out grown his spot. Had to move the Moon Brain because the nem was starting to block the light off it where it was. Now some times at night the nem moves down to where the Moon Brain used to be (to the right and lower) but goes back up top by noon. Take a look at my thread, that's what you look for when judging whether to treat or not. Very nice looking mag though! I did a phone video of the clowns loving their nem. Love watching them in their nem, happy as a dog rolling on something stinky! what lighting you have it under ? A Kessil 360, don't have a Par meter but the light is about 10" above the water at about 2/3 power. Fairly bright is the best I can say. 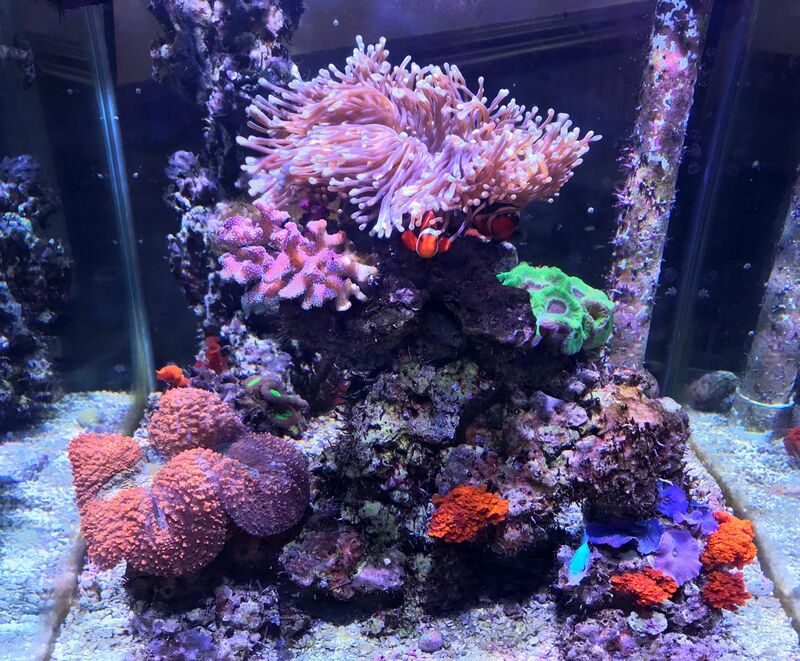 I have a Candy Cane or Trumpet coral that was mid tank and when I moved it to the bottom it is doing much better. 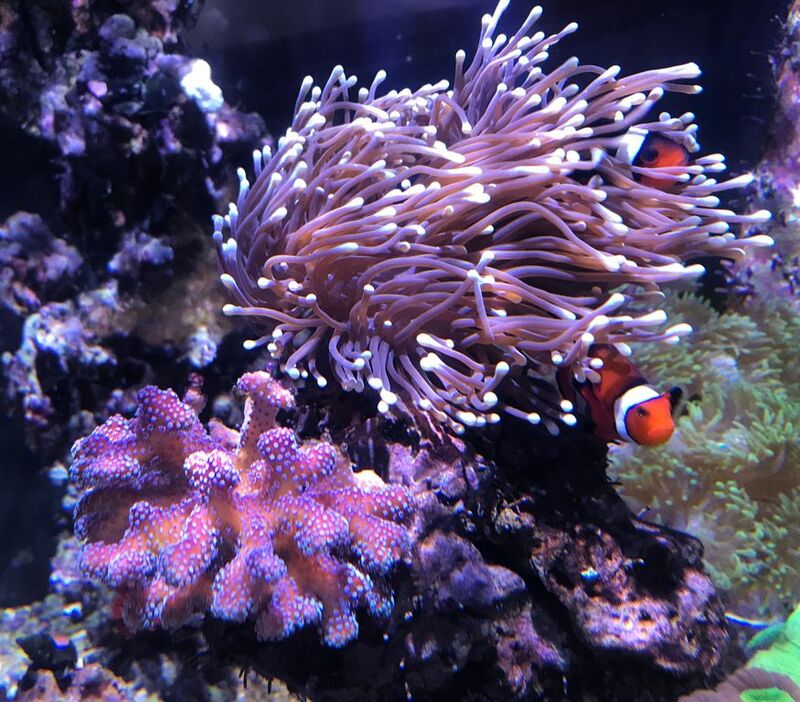 How long did it take for the clowns to go to the anemone? I will say I appreciate the pairing of the correct new with the correct clown. It seems like so many are pairing up bubble tips with occys and percs which just isn't natural. 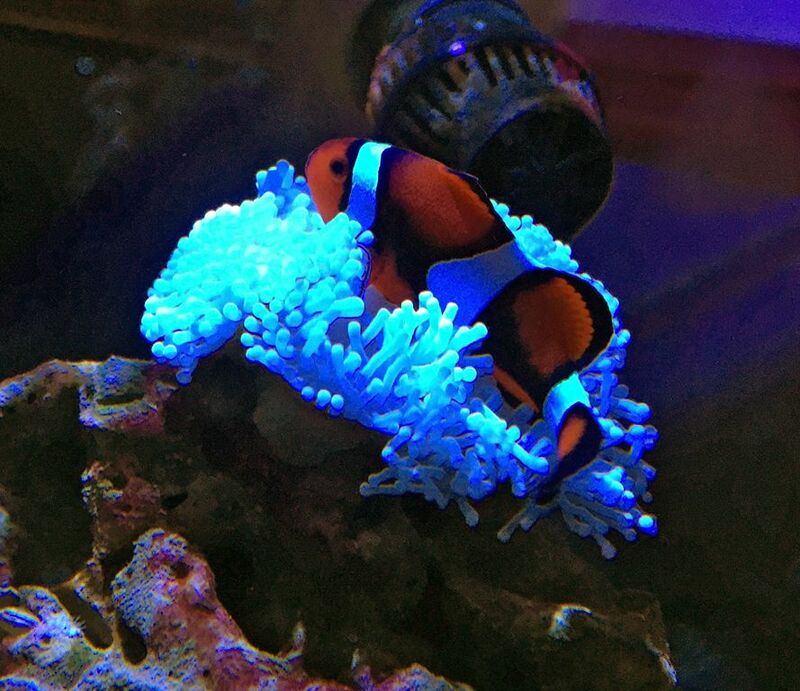 I have bubble tips, but I got the correct clowns to go with them (naked cinnamon clownfish). Mine so far have no interest in the anemones. I'll probably have to coax them in. These only took a few days, don't remember exactly but seems like just 2-3 days and they were home. I have wanted to do this for years. About 10-12 years ago before I knew why they didn't survive shipping very well I got a big beautiful Ritteri from LA and it didn't make it. Live and learn I guess.